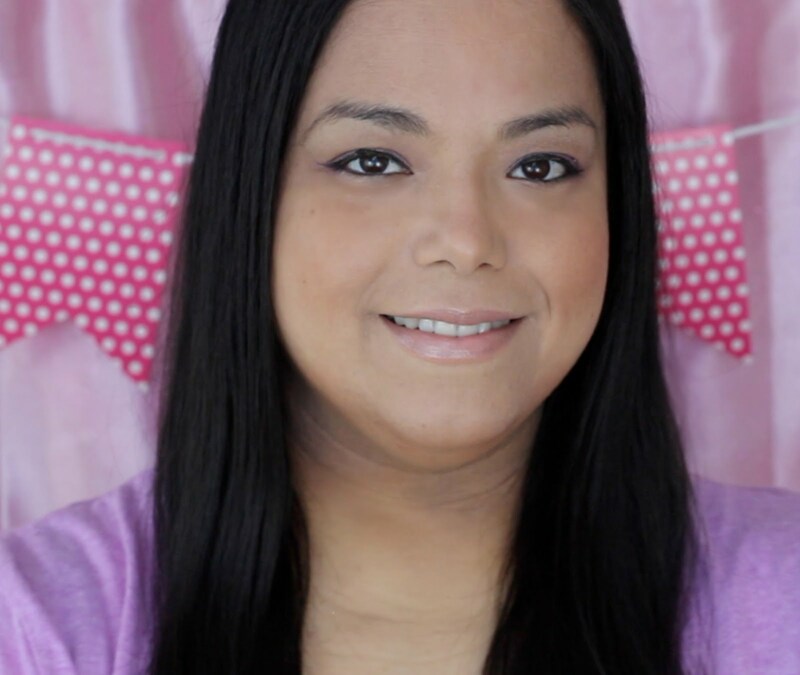 Last month my family and I went on a long weekend trip to the Poconos to stay at a resort and indoor water park. One our way back to New York we went to one of their most talked about malls and there was a Toys 'R Us Express. I took the toddler into the store to get something to entertain her on the long trip back home. They had this really big piano floor mat that she fell in love with. She didn't even look at the toys she could get because she was too busy with the piano. Hopping away at the big keys she loved all of the music that came out of it. I knew I had to get her one for Christmas. Christmas came early when I got the opportunity to review the one from Click N' Play. As soon as I showed the toddler the box she was jumping for joy. We took it out of the big box and installed 4 AA batteries that I had already on hand in anticipation of getting the piano. 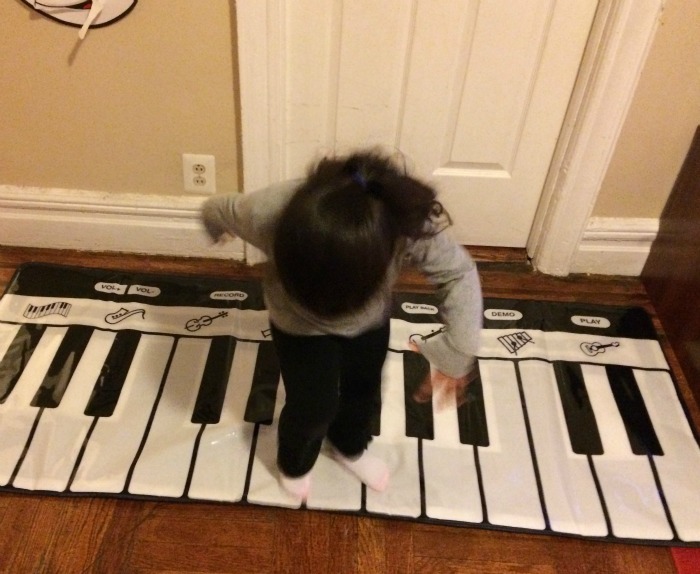 We put it on the floor and off my toddler went playing some music with her feet and hops. 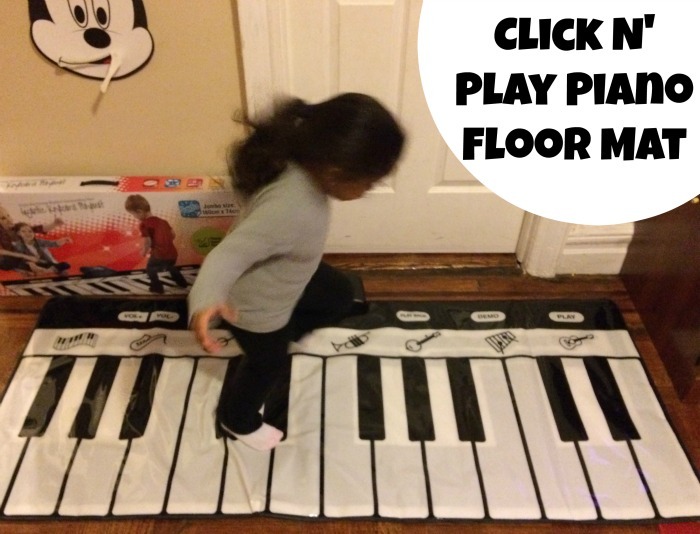 The piano mat is very durable and made of a really thick heavy duty vinyl. My daughter can jump around it for a long time and it looks like it can withstand the energy of a toddler. The mat is 6 feet across so it is huge! Since it is so big I love how much my daughter is being active by running back and forth and hopping on it. It has 8 different built-in instruments like a guitar and violin so you are not just getting a piano. The volume is adjustable and I love that it has an automatic "power off" feature so the batteries won't wear out. You can purchase one and learn more about the piano on Amazon. This really sounds like great fun and will keep any young child very busy on those days they cannot go outside!! This looks like SO much fun! What a great gift idea! She looks like she is having a BLAST! That looks like so much fun! 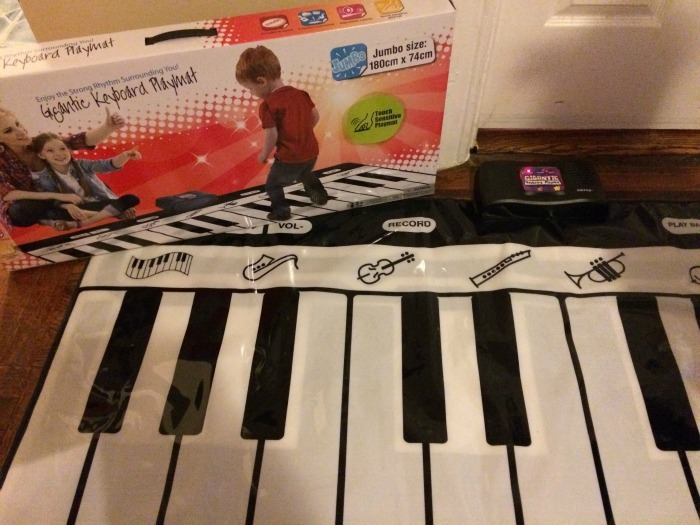 It's a nice size and a kid can get some exercise and learn about music at the same time. That's good for the brain. This would be one of those things I pull out every now and again. I think it would give hours of fun every time. This is so cute, I'm sure my niece would love it. This would be perfect for my granddaughter. I might get it for her for Christmas. In fact, it's probable that I will.